Warning: This page includes real animations. Please do not keep watching them for a long time. Although this page has carefully avoided the known harmful stimuli, unknown ones might happen to be included. Never copy them. "Iris-induced line motion illusion of eyelashes"
For explanation, see the Japanese page. "Apparent movement-accelerated line motion illusion of eyelashes"
After adapting this motion stimulus, illusory radiation of noise appears in a short time. The Ebbinghaus illusion occurs even if two groups are successively displayed. The image appears to fluctuate. Hearts appear to flutter. For those those who wear glasses, try to move them; then the hearts appear to move. For the majority, the hearts appear to be in front of the surface of white random dots when they are bright, while they appear to be behind it when they are dark. A record appears to contract. If you can stop this animation, an expanding motion aftereffect is observed. 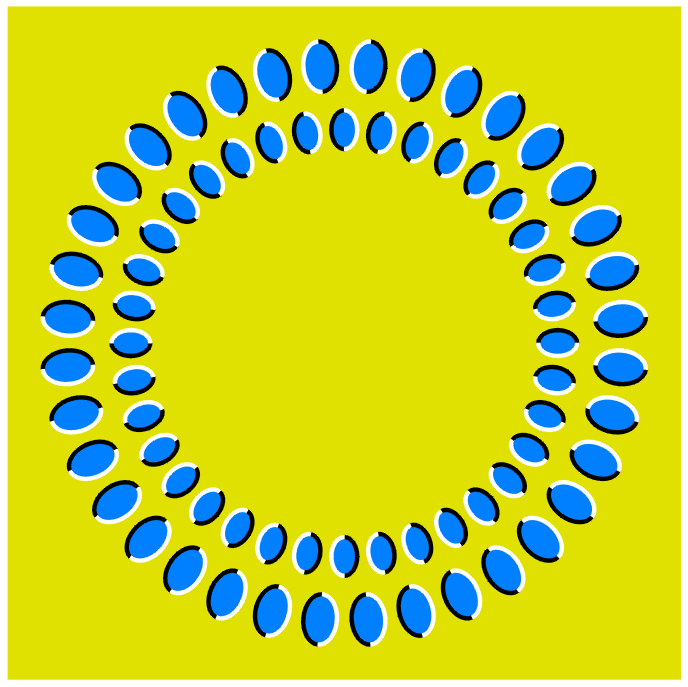 I think this illusion is the same as the spoked wheel illusion proposed by Professor Stuart Anstis. Anstis, S. (2003) Levels of motion perception. In Harris, L. and Jenkin, M. (Eds.) Levels of Perception, New York: Springer. The inner ring appears to rotate clockwise while the outer one counterclockwise like a perpetual motion machine. Actually, animation is not indispensable for this effect as shown below. Two dots move rightward along parallel paths, which appear to tilt or curve. As to this illusion, Sumi and Nakamura (2005) (in Handbook of the Science of Illusion) reviewed three papers shown below. Nihei, Y. (1973) A preliminary study on the geometrical illusion of motion path: The kinetic illusion. Tohoku Psychologica Folia, 32, 108-114. Nihei, Y. (1975) The effect of direction of motion on the magnitude of the geometrical illusion of motion path: The kinetic illusion II. Tohoku Psychologica Folia, 34, 88-94. Swanston, M. T. (1984) Displacement of the path of perceived movement by intersection with static contours. Perception & Psychophysics, 36, 324-328. Rings of balls appear to rotate.